LUBBOCK, Texas – Friday night, January 18, 2013, the King of Country Music, George Strait, kicked-off the first of 21 tour stops on his 2013 The Cowboy Rides Away Tour in Lubbock, Texas at United Spirit Arena with special guestMartina McBride. An audience of 15,326 was afforded what will soon be a rare occurrence–seeing Strait and his Ace In The Hole Band live in concert. The evening began for many with a VIP reception in the aptly named “The King’s Tavern” which features multiple traveling memorabilia cases on display as part of “The King’s Exhibit” with featured items ranging from Dusty Chandler’s jacket, Strait’s lead character in Pure Country, to his Country Music Hall of Fame medallion from his November 2006 induction. The Allen family will receive a one-story home with 1,717 sq. ft. of living space and is a spacious 3 bedroom/2.5 bathroom home in Bakersfield, California complete with a pool and a two car garage. The homes made available for the program are donated to MWSF through partnerships and, as unveiled at the show in Lubbock, will be awarded to one service member at every tour stop on The Cowboy Rides Away Tour. Jan 19 | Chesapeake Energy Arena | Oklahoma City, Okla.
Jan 31 | Sleep Train Arena | Sacramento, Calif.
Feb 1 | SaveMart Center | Fresno, Calif.
Feb 2 | MGM Grand Garden Arena | Las Vegas, Nev.
Feb 15 | Xcel Energy Center | St. Paul, Minn.
Feb 16 | Alerus Center | Grand Forks, N.D.
Feb 22 | First Niagara Center | Buffalo, N.Y.
Feb 23 | XL Center | Hartford, Conn.
Mar 1 | Thompson-Boling Arena | Knoxville, Tenn.
Mar 2 | Rupp Arena | Lexington, Ky.
Mar 22 | Bi-Lo Center | Greenville, S.C.
Mar 23 | Greensboro Coliseum | Greensboro, N.C.
Apr 5 | The Pit | Albuquerque, N.M.
Apr 6 | Pan American Center | Las Cruces, N.M.
Apr 12 | Verizon Arena | N. Little Rock, Ark. Apr 13 | New Orleans Arena | New Orleans, La. For more information on MWSF, please visit www.militarywarriors.org. 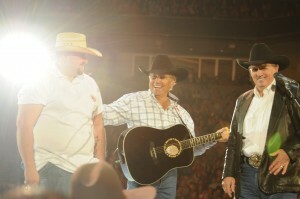 For more information on The Cowboy Rides Away Tour, please visitwww.georgestrait.com.